Pawsitive Impressions: PET-CENTRIC Owners Rick and Gloria Sands Throw a Retirement Party for Their Feline "Team Members"
PET-CENTRIC Owners Rick and Gloria Sands Throw a Retirement Party for Their Feline "Team Members"
Pet Supplies Plus team members Charlie and Chloe had such a great retirement party that it was covered in the local newspaper. At the Goldsboro Pet Supplies Plus location, Charlie and Chloe were kind of a big deal. 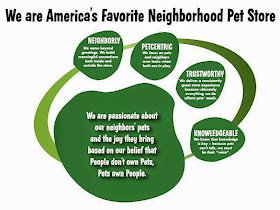 You see, Charlie had been with the company for fourteen years, and Chloe for about eleven, each serving in the position of "loyal shop cat" since being rescued as kittens. According to franchise owner Gloria Sands, who was interviewed in the Goldsboro News-Argus, Chloe and Charlie will be able to rest a little easier without the distractions of the store. "A home is different than a store," she told columnist Kirsten Ballard. Charlie is enjoying retirement with Gloria and her husband Rick in their home, and Chloe is living with a former team member, who also happens to own Chloe's sister. 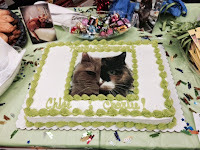 Neighbors were invited to come and say goodbye to the cats during a four-hour party that featured a cake with photo both Chloe's and Charlie's face "photoshopped into one cat." It was a grand send-off and, while neighbors are disappointed that Chloe and Charlie aren't hopping into their carts for "ride-alongs," it's clear that the feline pair have earned the right to some rest. Congratulations to Chloe and Charlie on their retirement, and hats off to the Sands and their terrific team at the Goldsboro, North Carolina location for the years of love and care they gave to their two favorite team members.